Reality doesn't always meet your expectations. It's been seven weeks since I moved to Los Angeles and to be honest, it hasn't been easy. In fact, it's been really tough. I understand that adjusting to a new city and new lifestyle takes time and cannot be rushed but I can't help that I want to find that sense of belonging and that feeling of familiarity. To those who have experienced this, how did you cope with it? One thing I am trying to do is to "stop and smell the roses" and recognize all the little things that do actually matter. This saying is very helpful and definitely help me stay grounded. Focus on and appreciate the positives like all the beautiful places Los Angeles have to offer. 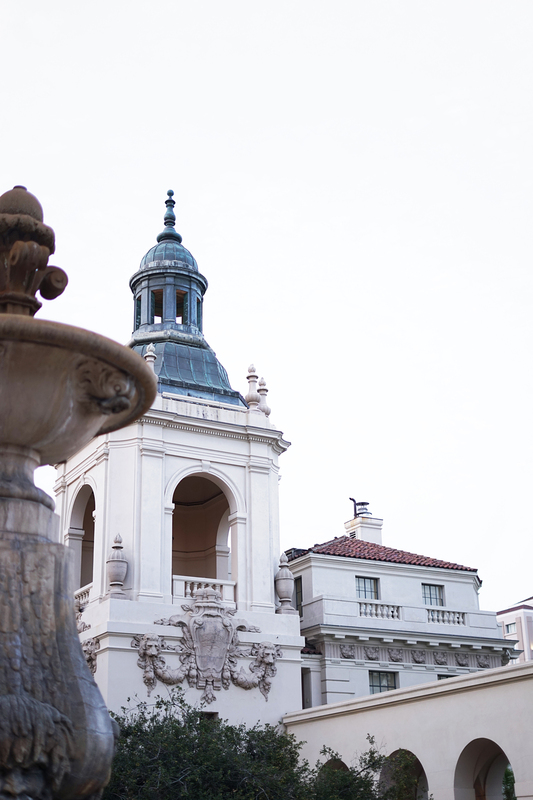 Couple of days ago we decided to take a detour to Pasadena and stumbled upon the charming city hall. The building itself is gorgeous and it reminds me a little of France with its cute courtyard and fountain. 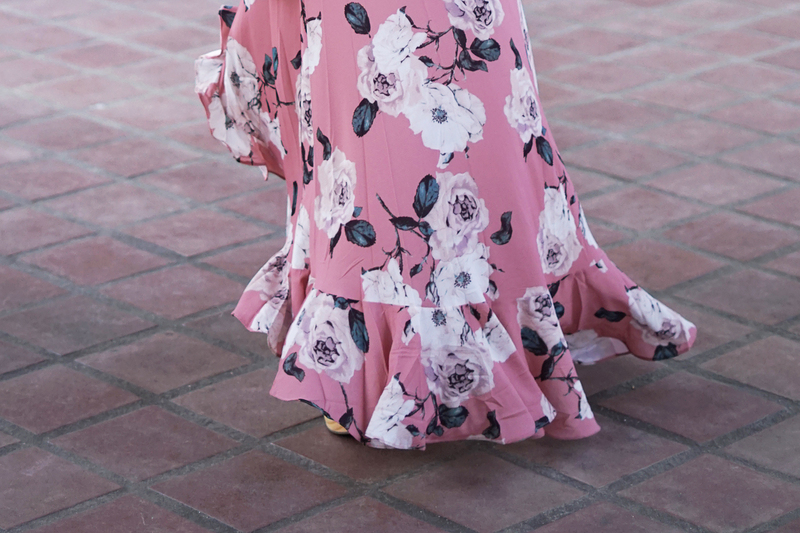 Coincidentally I wore a pink flowy high-low dress by Selfie Leslie from PacSun with roses and ruffles and it was simply picture perfect. Life isn't always rainbows and unicorns, you just gotta look at the bright side and be grateful for the little things. 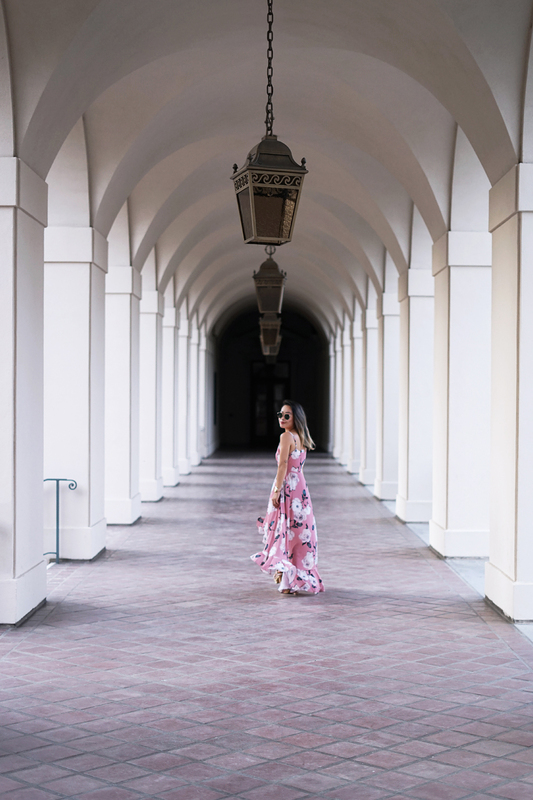 Pink floral maxi dress by Selfie Leslie c/o PacSun. Classic round sunglasses by Ray-Ban. Strappy platform heels c/o Koolaburra. Rose gold mesh watch c/o Christian Paul.